The minute books of Belleville's Musicians' Union are a valuable asset. This sheet, dated August 22, 1912, states the expenses and receivables of a "Picnic Committee". The set of record books also reveals interesting information regarding union organizing, membership lists, dues and fines. The entertainment musical tastes of the general public and the instrumental makeup of the bands over the years are interesting to review. 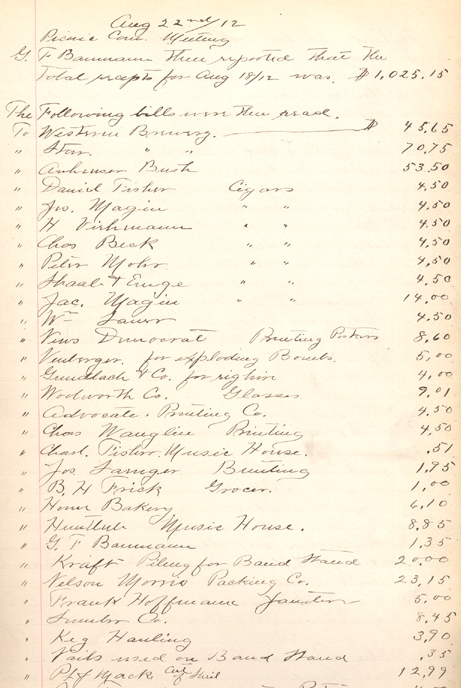 The Archive also includes record books from coal companies, brick layers and brewery unions.